A good reason to return back to their hometown, with a new agenda. Why are so many people trying to escape Africa. Many flee from their native village to the over populated & polluted big African cities, often ending up in poverty, low income jobs and slums. Africa actually holds an abundance of opportunities, due to tropical climate and especially abundant solar energy. 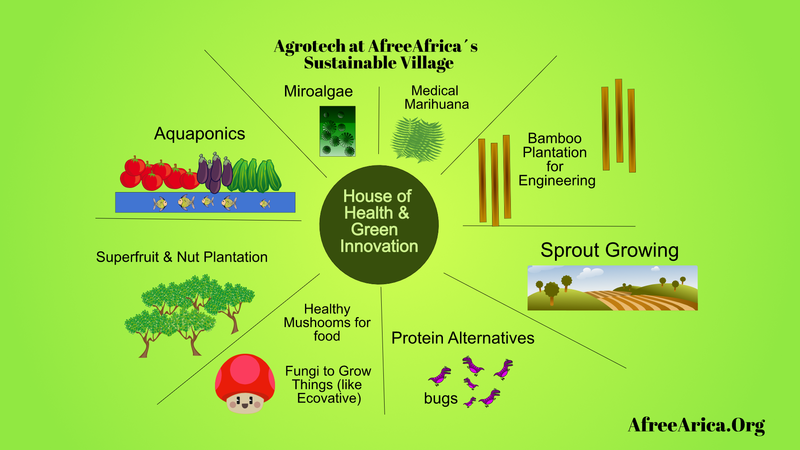 AfreeAfrica creates a sustainable green hot spot, namely "House of Health & Green Innovation" in Ghana, by using latest green technology, purifying water, solar power, production on natural resources, creating a green environment for growth, health and wealth. 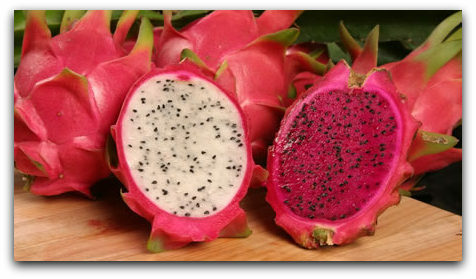 Nutrient components in water and sunlight turned into a fertile process, which ends up as different nutritious products. 8. Building a sustainable fishing farm, which will not necessarily capture the fish, but protect the existing fish and fishermen in their local areas. 9. A Computer Net Café with ongoing causes in online marketing and local start up businesses. 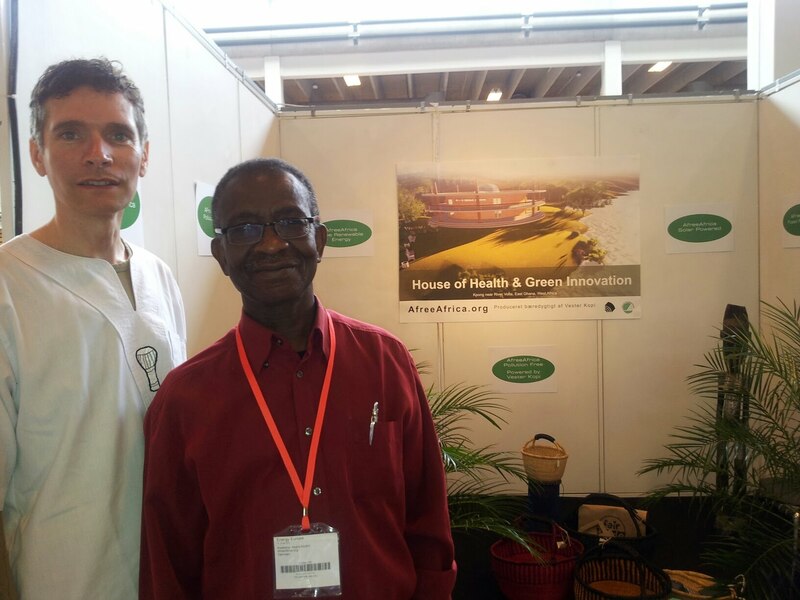 AfreeAfrica´s stand at The Energy Europe Fair 2013, illustrated some of the activities which are intended at the House of Health & Green Innovation. The whole stand was based on green technology, and even flyers, banners and our business cards were entirely green, delivered by Vesterkopi in Copenhagen. Bamboo bikes from Ghana were brought in to show that it is indeed possible to build feasible green items for daily use, with natural composites from the local area. What is the Cost of Economic Growth? We are mainly interested in human health, and local prosperity before wealth. But the economic foundation is essential to the growth potential. We wish to be transparent and are open towards any ethical question concerning implementation of the project and state with open minds that the project is essentially build on human health before economic wealth. 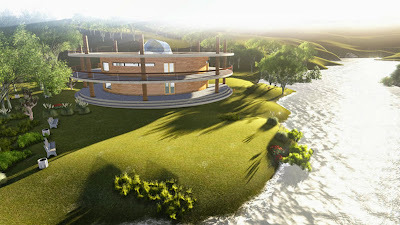 We wish to place the first House of Health & Green Innovation right in the middle of the nature in Ghana, to benefit the local people by creating jobs and turning the potential of the soil, sun and nature into a joint venture. The house is based on Green Growth & pure Greentech solutions as opposed to only Wealth Growth and westernized profit based ventures, where growth is often equal to solely economic growth. Often rural villages in Africa are being abandoned, because the young people travel to seek wealth in the nearest biggest City, in the hope to become "rich", turning the major Cities into constantly growing disastrous concentrated "Pollution Machines", soaked in filthy waste, due to lack of proper sewage systems, lack of sufficient toilets solutions, fossil oil based products, plastics, tensides and chemical management systems. Quite often the most pollutive companies are also those who has the biggest income. What is the value of all the material goods, if by the end of the day even the richest man does not have a single drop of clean water to put into his drink. In Ghana as many other countries in Africa, foreign investors are allowed in, primarily based on their economic capabilities. Some of the worst scenes are taking place in the Northern part of Ghana, where foreign Gold diggers are completely undermining the nature and leaving whole areas as plain mud fields, poisoned with mercury and other chemicals used to harvest the Gold. Trees and plants growing there for millions of years are gone, meaning the trees and plants providing food for the locals and the water reserved contaminated for eternity. Often the abandoned mines are later occupied by young African men who dig even deeper for grains of Gold which may be left, ending in disasters when the the whole mine collapses. Just one example of the consequence of foreign African commercial intrusion with one eyed hunt for economic wealth, without considering either nature or sustainable growth or health. Artist Markus Kayser has made this 3D glowing printer, which melts sand and prints objects. In the future. In the future, may be parts for houses or any other material for construction. Behrokh Khoshnevis, Director, Center for Rapid Automated Fabrication Technologies (CRAFT) on the long road to being able to rapidly print out almost any shape of house in less than 24 hours. Good News. Never before has it been that accessible to give millions of people who are forced to live in primitive sheds and huts a cheap decent home where they are protected against both, cold, heat and water. 3D printing has long been an interesting way to make the distance from drawing sketch to final product. Now this technique makes it possible to print big scale with special resins which makes it possible to print a single house in just 24 hours. One Chinese company has gained over 13 years of experience in this field and put several at public display, claiming that only their patented moulds makes this single tube printing possible.